We are on the final approach of finalizing the first of two bills at the Capitol and need your help once more! Tomorrow before the Senate will be the final approval of Senate Bill 2243 which prevents any bus rapid transit to be built in the center lanes of any state highway. The passing of this bill will help us in 'Stopping the AMP'. 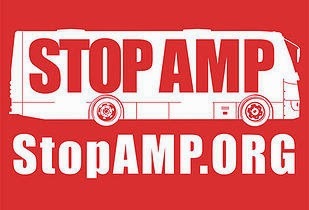 We are urging all STOPAMP supporters to contact all the Senate members and ask them to support and pass Senate Bill 2243 tomorrow. Listed below is a link to email all the Senate at once. We also encourage you to attend the Senate Session which will be on the second floor of the State Capitol at 8:30 a.m. and to please wear RED. This bill is the 6th on the Tennessee State Senate Calendar in the morning and should not take long. Thank you for all you have done to help make this bill into law. Without you we would not have been able to accomplish this! You have truly made a difference! For a link to the email addresses of Senate Members click here. Click here for sample letters to help you create your communication. Be sure to visit our Facebook page and share with your friends!